Mum's story ... I awoke on Sunday morning feeling a little different than usual, with mild and intermittent aches in my lower abdomen. We spent the day out at a beautiful National Trust venue doing lots of walking (and eating cake! ), unaware that I was in the very early stages of labour. We had been given an induction date but I was keen to try other more natural ways, such as acupuncture – which I did have, to give Aurora a nudge, and to also delay our induction for as long as was safe if she hadn’t arrived by then. The hospital had been helpful and informative about how this would work. In the evening we curled up in front of a film; ‘Four Christmases’ – a favourite, during which the surges grew stronger and more frequent. We headed up to bed but were restless; I bounced on the birth ball while Ben read to me and about midnight we began timing the surges while we rested in bed. By 1am they were coming every 3 minutes and lasting about a minute. A while later we decided to keep our strength up and Ben made us poached eggs on toast. At 4am we called the Royal Berks and they advised us that we could come in when we felt we wanted to, so half an hour later we headed in just so we could assess where we were. We were assessed in the midwife led unit – by a midwife who was a hypno-birthing practitioner! She complimented us on how well we were hypno-birthing as we were calm and relaxed, and I was managing the surges with breathing. Because I was so calm she gave us the option of an internal exam as it was the only way to tell how dilated I was and we agreed. She talked to Ben about the results and he said we were going to go back home and relax there for a while. This was fine for us, as we wanted to stay in the most comfortable and relaxing place for as long as possible. We spent Monday resting and fuelling, still timing the surges. They remained at 5 – 3 minute intervals all day, and I continued using my breaths through them. They were completely manageable, and I was still able to enjoy my time with Ben. We lay in bed and listened to our relaxation tracks, bounced on the birth ball, went for a leisurely walk around the block, ate lovely food, talked, played cards in the garden and really enjoyed each others’ company – we made the most of the quality time together which felt special. Ben was looking out for a change in my behaviour; a focussed energy resulting in reduced interaction, and this began in the early evening. At about 10pm we went back into the hospital. We were greeted by the same midwife who had been off shift and was now back on again! She advised us to stay at the hospital and we were given a room with a birth pool – what we’d hoped for! We made the room ours by hanging up our hypno-birthing washing lines of pictures and positive affirmations, playing relaxing music and getting changed into comfy clothes and slippers. The next hours were spent being given an aromatherapy massage, adopting different positions, using Ben’s soothing strokes, walking sideways up and down the stairs, lunging through the corridors, and again enjoying the intimate and special time together as a couple. The midwife checked my blood pressure and Aurora’s heart beat intermittently, I had minimal internal exams, and we were given our own space to work together, in our own way, to bring our baby into the world. In the early hours of Tuesday morning our midwife accidently broke my waters during an exam. I got into the birth pool, which felt wonderful!, and my surges intensified. After a little while, at about 7am on Tuesday morning, the midwife decided, as a precautionary measure, to transfer us to the delivery ward as my urge to bear down was putting pressure on Aurora’s head and causing her a little distress. We were told that the baby needed to be continuously monitored and that we needed to see a doctor (but they were all in theatre so we could be waiting for hours) and would probably be offered an epidural to reduce my urge to bear down. This was far from what we wanted; a clinical room, medical intervention – with no control over how long we’d be waiting to for a doctor – and to be hooked up to the monitors. I was ready to ‘tap out’; I thought if that was the case then we might as well get it over with as soon as possible with a caesarean, but I put my headphones on and concentrated on my breathing while we were transferred, and Ben immediately closed the blinds in the delivery room. I really didn’t want to lie down so we moved the bed into a fully upright chair position, and I was attached to the monitors. Even in my lowest moment, I knew my hypno-birthing techniques would ease how I felt and it was so valuable to have those tools at my disposal. This was the toughest part; waiting for a doctor and not knowing what was going to be suggested. However, we were moved down on a shift change and had the most wonderful midwives. They took a few minutes outside to read our birth plan and fully took on our preferences and allowed us to hypno-birth as we’d hoped. After a little while I asked if we were still waiting to see the doctor and Chris, one of our midwives, encouraged us with ‘I don’t think you need to see the doctor; the baby is happy so I think we can continue with the first plan’. This was so wonderful! We could continue forward with our natural birth, without intervention and the baby would continue to be monitored. It didn’t feel like we were in limbo anymore, we were actively working towards Aurora’s birth again. We got our wind back and soon we were moving about, dancing, Ben gave me a foot massage, I changed position, we had the music on – all the time Chris and Sylvia simply moved the monitor and wires with me! Having our birth preferences written out made all the difference to our experience; our entire care team knew what we wanted and could easily facilitate it for us. All information went through Ben which meant I was protected from any sense of boundaries, medical expectations or level of progress (except the positive bits!) and he could frame the information in a way that he knew would encourage me. It was also a great comfort to hear details from Ben and be always reminded of our team, and hold onto the intimacy and security of being together. Our birth plan also meant that we were offered the possibility of still having a water birth, even though we were now on the delivery ward. In the end we had a beautiful birth without it, but just knowing it was still possible made a huge difference to our sense of calm and relaxation. The best part though was that Ben got to deliver Aurora. We had asked on our plan that Ben be in the water too, and pass Aurora up, and even though we were birthing in a different way our midwife said to Ben ‘I’ve been watching you two all day and if there’s anyone who deserves to deliver your baby it’s you’. That is a really powerful experience, and the first person to ever hold our baby was her dad. Throughout our birth we were able to stay in tune with each-other, we never felt rushed, or out of control. Even in the hour or so that it seemed ‘plan A’ was out of the window and we were faced with potential intervention I remained calm through each surge, and confident in the knowledge that nothing would happen without our understanding and that we wouldn’t be rushed. So, though to look at our birth preferences it could appear otherwise, we had the perfect birth because it was exactly what we wanted; calm, empowering and natural. And that made it absolutely joyful: just minutes before she was born Ben and I were laughing together with excitement. Aurora was born asleep. She looked up at Ben, looked at me and went back to sleep in my arms. We had hours of skin to skin, I birthed the placenta naturally about 40 minutes later, gave Aurora her first breastfeed, Ben held her while I was looked after wonderfully – and all before she was weighed or any of the tests were done. We were able to bond with her right away, which was hugely precious. Our midwives shared that our birth was an honour to be a part of – that Ben should re-train as a midwife! – and that, though we should have a home birth next time, they’d like to be there just to see it! One of our midwives was just finishing her training, so to know we had such an impact on her was lovely. Our birth was truly amazing, because everyone worked together at our request to give us the best opportunity to succeed at our desired birth, and because we believed that together we could have it. SHE IS ABSOLUTELY AMAZING AND WE ARE TOTALLY BESOTTED! Our little Lola arrived on Monday 30th June, one day after her due date. I hadn't had any signs, not one braxton hicks so I thought she was going to be 2 weeks overdue! The midwife examined me and said she could feel babys head! She couldn't tell if I was dilated as my cervix was too far back. I started feeling surges while we were at the hospital (again in my back) these were mild. We were advised to call again when the contractions were stronger and closer together. We thought Ian might as well go to work as I wasn't having strong surges at this point. I downloaded an app to keep an eye on the surges. I decided to have a bath when they were a bit stronger and by 11 they were quite strong so I called Ian to say he needed to come home and get the pool filled up. I was walking around the house breathing and mainly standing and leaning on a chair to breathe through a surge. I did use the birthing ball at the beginning but found I preferred to wander around when they were stronger. My brother had phoned as he'd been sent home from work because half of Reading didn't have water! Luckily we did! I phoned the hospital again just after Ian got home and had to pass the phone to him during a surge! They were sending a midwife from Newbury. Ian had started filling the pool up and this was full by the time the midwife arrived approx 1300. When Ian had arrived home about 11 I'd started using the tens machine. Now a lot of people say you can't really tell if this is working until you take it off! I think this definitely helped me while I was walking around. Andy Murray was playing at 1 so Ian set the TV up so I'd be able to see it from the pool! I can honestly say I paid no attention to that tennis match at all! I played some hypnobithing MP3s while I was in the bath but I wasn't fussed about having any music or MP3s on in the background during the labour. Ian was there if I needed him but I was generally happy wandering about with the tens machine during the surges! The midwife checked me when she arrived at 1300 and said I was 4-5cm dilated thank goodness! I then got into the pool which was really soothing with the warm water. Ian was sitting on a footstool with his hands over the edge into the pool. So the surges were getting stronger and I had an overwhelming need to push. The mw said I should wait for the next couple of surges to see if I still felt like I needed to push....I did! I got out of the pool and when the mw checked me I was fully dilated so she said I could do whatever I needed to now! The other midwife arrived at some point (no idea when) and they hadn't had time to pick up any gas & air. I was already too far gone for this anyway! I was pushing for about an hour in the pool and could feel Lolas head coming down and then gong back up again. Towards the end we changed positions in the pool but I felt like I wasn't pushing enough to get her out. The mw said we would need to call the ambulance to take us to the hospital as I'd been pushing for over an hour. I was out of the pool with my leg up on the side of the pool at this point. I was absolutely adamant that someone else needed to get the baby out! Even as I was saying this I knew that even if we went to hospital I'd still have to push her on the way! Forgot to mention that in between surges I felt like I could sleep! I was very quiet and focused. The mws were monitoring the babys heart every 15 minutes and I was having to stand up which I found exhausting so wouldn't stand up every time. We discussed this on the course but I think if you have the baby in hospital they can use this equipment underwater? If I were to do this again I would ask not to be monitored so frequently but this depends on how comfortable you are not being monitored. Since having Lola a few people have commented that couples that do hypnobirthing seem to have shorter labours! I feel really lucky that the labour as so short and hope you have a similar experience. I think the hypnobirthing really helped with first stage of labour and also my pregnancy yoga! Imogen Hayley Noelle was born on Sat 7th Dec at 11.31pm. I'm just writing to thank you for your amazing support and help, which allowed us to achieve the natural water birth at home we'd so wanted. My waters broke at 7.15 am on the Sat but I didn't have any surges and I was told I had 24 hours to go into labour before being induced. So we tried some of the natural methods you suggested and I began having mild surges around midday! To help the time pass, we went for a walk (ordered our meat for Xmas day from the local butcher), watched our favourite comedy show and I bounced on my ball. We lit scented candles everywhere and had the wise hippo instrumental track on repeat. We turned our living room into a relaxation sanctuary and all these triggers helped me to stay calm and focussed. As the surges intensified, I found walking up the stairs really helped. Our main midwife (who was amazing) came out at 7pm. She read our birth plan and said she'd stay in the other room and let us just get on with it. Then she did an exam and told Rich to put the pool up as I was already 5 cm dilated. The rest of the night was a bit of a blur, but all the breathing exercises helped massively, especially the surge breathing and hum breathing. Rich kept praising me the whole time and doing soothing strokes, which eased the discomfort. Another midwife and a student (who was actually super-lovely) turned up. Unfortunately ,this senior midwife didn't really 'get' hypnobirthing and wouldn't shut up…until I shouted at her. She was quiet after that. The midwives were extremely impressed with my breathing and the way I coped without any pain relief. All the practising and videos we watched enabled us to feel totally prepared and just go into the zone when the time came. My labour was 12 hours in total but I avoided looking at any clocks or asking how I was progressing, it all felt like a dream. I wanted to email you much earlier but unfortunately the postnatal care we've received has been awful and would make me hesitant to recommend a home birth to friends. Immy was born at 11.31pm but no one came to visit us till 7pm the day after. I told the health visitor I was really concerned about her feeding as she was so sleepy I couldn't get her to breastfeed easily - she'd latch on but wouldn't suckle. Her advice was just to keep trying. On Tuesday we realised that she had jaundice and we were admitted to hospital on Weds afternoon till Thurs night (didn't manage to escape hospital dammit), so that set us back a bit and knocked my confidence in terms of feeding. However, since Friday she has fed really, really well and put nearly all the weight she lost back on. All the midwives have commented on how calm and alert she is, due to the labour. Thank you so much for your lovely card, I can't wait to bring Immy to meet you in the new year during one of Rich's lessons. The birth has also made me more determined to do the hypo course too and thanks again for lending me your books. Our little lady arrived on Friday 7th august around 5pm, she's a bundle of gorgeousness and we're loving her. We were planning a home birth but my waters broke early before contractions started so I had to go into hospital to be monitored, and once we'd got there contractions had started I knew we weren't going home before she arrived. I used tens-machine initially along with the hypno-birthing techniques and was then able to get in the birthing pool for a majority of the labour which was great along with using the hypno- birthing breathing etc. when her head came out so did her hands which were up by her face (oooh!!!) so somehow they got me out of the birthing pool and onto the mat alongside where with the next push she came out. I think I slightly rushed the last part, rather than humming her out, just remember being determined to get her out before the midwife went off duty!!! All in all it was a very positive experience, unfortunately with her hand position I tore so had to be taken to theatre to be stitched and needed a spinal anaesthetic - shame after our natural labour. All worked out for the best tho and little Mia Rose is doing just great. Louise, thank you so much for all your teachings I have loved the wise hippo birthing techniques from the beginning, they have been easy to learn, to practise at home and to use in labour - we both felt so much more prepared and confident around the birth. The midwives were amazed at how easeful and quick my labour was for my first and my age!! It was recorded as approx 5hours established labour and 18mins 'pushing'. I was very happy with this. I WOULD RECOMMEND EVERY WOMAN HAVING A BABY TO TAKE THIS COURSE! I had not heard of HypnoBirthing until I was recommended it during the early stages of my first pregnancy. I began sessions when I was about 30 weeks pregnant and a bit nervous about what the latter stages of pregnancy and birth would be like. Not really knowing what to expect, I really enjoyed the sessions right from the start. Louise made us feel completely at ease and really showed us that our preconceptions of labour were responsible for our fear around it, and that in fact, we could have the birth we wanted without the pain and horror often associated with childbirth. We learned about the way your body works and how you can facilitate it doing what it naturally can do to have a smooth and comfortable birth. I found the relaxation and breathing techniques absolutely invaluable during my son’s birth especially as we had some special circumstances, which meant I had to have a c-section. Thanks to the HB course, we remained calm and employed our breathing techniques much to the surprise of the doctors and midwives. In fact, I got to 9cm dilated without any pain relief at all, before the decision had to made to perform a c-section. Most importantly, Louise taught us how to work as a team and really showed my husband what an important role he could play in the birth. We came away from the course calm, knowledgeable, ready and excited about the birth and had a much better experience as a consequence. I would recommend every woman having a baby take this course – especially with Louise as their practitioner! I'M SO GLAD WE FOUND HYNOBIRTHING!! What a lovely surprise to see you in Alto Lounge today, and what a coincidence on Esme's first time out! Just thought I would let you know how the birth went and how we were able to use the hypnobirthing techniques we had practiced. We went out for a walk & lunch on Sunday morning when we got home later in the afternoon I started to feel slightly sick - a sort of stomach crampy, food-poisoning feeling. I thought that what I'd had for lunch had given me a dodgy tummy. I lay down for a bit and listened to my rainbow relaxation, then Matt and I watched a film while I bounced on my birth ball. Around 6pm I vomitted a few times and this confirmed my suspicion that I had food poisoning. By about 9pm I got Matt to phone the maternity triage line to ask them about whether food poisoning was dangerous at this stage and whether it could be me going into labour. They said I should come in and be assessed. We got there around 9.15 (didn't even bring baby's hospital bag in, I was so sure i wasn't in labour) they were concerned that I had sepsis as I had a very low temperature, was sweating but was shivering. They did an exam and found that I was 7cm dilated and in active labour! My sickness was just my body reacting to the high levels of hormones being released in my body. I was beyond thrilled! Up to that point I hadn't been able to use any surge breathing as I wasn't really getting surges. I was able to use a room in the new midwife-led centre at the RBH which was lovely - no bed in the room (or at least it was hidden away in the wall). It was just a nice room with beanbags, a big bath, birth ball, stool etc. Didn't feel too medical at all. Once I knew I was in labour, the surges started coming every couple of minutes. It felt like it went from zero to 100 miles-per-hour in minutes, and I did end up using the gas and air during the surges. I dealt with the surges by counting out loud - with Matt holding my hand and counting with me - I don't know where that came from, I hadn't practiced it as a technique. We put the rainbow relaxation & birth affirmation CD on in the room, and I was able to zone into that between surges to stay calm. I got into the pool for a while, but although thats where I thought I would like to give birth, I actually didn't really want to be in there - I wanted to be on the birth stool or standing up. Matt was great at bringing me drinks, feeding me jelly sweets and keeping me calm. Although I was aware of the midwife talking, it was only really Matt I was zoned into hearing. I started wanting to push - or rather my body started spontaneously pushing. I forgot all about breathing the baby down, I was completely zoned out and just focused on what my body wanted to do. The lovely elderly midwife was very supportive of my birth preferences not to have examinations, and encouraged me to push if thats what my body was telling me. At this stage I was on the birth stool and she though she could see the baby's head - this must have been about 1am, though I'm not sure.. Then, my lovely midwife had to go for a break and I got some other woman who came in, made me lie down and be examined ( I did NOT want to lie on my back, it was awful), she said there was still a ridge of cervix that I was pushing against and she wanted to break my waters to get rid of it. I was past arguing - if she said she wanted to stick pins in my eyes to get the baby out I would have let her! Matt did challenge her, but she was really insistent and we let her break my waters. She also told me I must stop pushing, she gave me some aromatherapy oils to inhale to stop me pushing. I think this whole thing slowed the process down by a few hours, she definitely interfered with the calm, in control feeling I felt up to then. Matt constantly challenged this midwife to stop giving me conflicting information about pushing/not pushing, which was great as it allowed me to focus on what I was doing. Anyhow, then the nice midwife came back and I got onto the birth stool again and she let me get on with pushing as that was what my body was telling me. Matt was sitting behind me doing light touch massage and talking calmly and quietly to me. I don't know what he was saying, but it was definitely his voice I wanted to hear to stay calm. So, I officially started the second stage at 3.30am and Esme was born at 3.55am. The midwife wanted to give me an injection for the third stage as she thought it was appropriate given my blood loss - It came right out after about 2 mins. When I was first examined in the triage Esme was lying on the right side, which could have led to a back to back labour, but she did a full 180 turn during labour and came out on the left. Clever girl! She was really calm and alert as soon as she was born. She was wrapped in a towel to stay warm and given straight to me. I needed a few stitches, so Matt held her and had skin-to-skin contact while the midwife was dealing with me. I felt totally high and elated after she was born and they were happy to let us go home straight from the midwife unit, but we decided to go down to the ward for a few hours to give her a chance to have a few feeds to make sure i'd got the hang of breastfeeding before i went home. We went home later that day. We'd left in such a hurry we had no crib set up for Esme! So, in the end, I wasn't a poster girl for hypnobirthing, but for me the benefit of what we learned was firstly, to trust my body and baby to know what to do and secondly, the calm breathing and visualisation between surges. And I think for Matt the benefits of hypnobirthing were maybe even more than for me. He was not at all a spare part which is how a lot of blokes describe their role in labour. I think it gave Matt the confidence to feel a necessary part of proceedings and to step in and challenge the midwife. He also seemed to always be there with food, water, massage, calm talking etc when I needed it, never having to be asked. There is no doubt that this contributed to a positive birth outcome for me & Esme. In the end, I got the natural birth I wanted, no drugs (apart from the gas &air) and no interventions. I always felt in control (apart from when the evil midwife came in) and my baby was calm and alert when born. I feel like she had a good introduction to life. These are the things I wanted from hypnobirthing. I totally credit this to the hypnobirthing and I would highly recommend it to anyone. I'm so glad we found hypnobirthing, I'm not sure we'd have had the same outcome without it. Sorry this is a bit of an epic essay!! Probably too much information, but i wanted to share the details with you as I felt our Saturday morning sessions had a big impact on it. Hope to see you soon and this time you can get a cuddle with her! Just to let you know that I gave birth to a beautiful baby boy last week - he arrived at 2.27am on Thursday 13th May. The labour was about 11 hours, but I was so relaxed that the midwives didn't really believe I was in full blown labour until we had about 5 hours left to go! They were amazed when they checked me out and I was 5 cm dilated. The slow breathing was what got me through it - it's a godsend. Ben did a rainbow relaxation when the surges were becoming very intense, which helped - and the arm stroking was a real rock, as was the background CD music. I casually wandered into hospital with my husband, not even sure I was in labour, only to discover that I was already 6cm dilated, and progressing fast! The midwives were astonished at how calm I was, especially for a first time mum! I didn't have any pain relief not even gas and air ... I just laid there and listen to my hypo-birthing CD ... I felt all the contractions but it wasn't scary I was just relaxed and concentrated on the breathing that I had been taught. It was really strange when the contractions got really strong and close towards the end I just slipped in and out of a really deep state of relaxation, they said I didn't make a sound. Once it was time for the baby to be born I automatically changed my breathing patterns and breathed him down to be born. Thanks for your lessons, we will spread the word for you!" I can't imagine how anyone gives birth without it! HypnoBirthing kept me feeling calm and in control throughout labour. The contractions were no problem at all. This meant that I avoided the use of pain-killing chemicals. I believe in myself (mind and body) a lot more now, and feel that perhaps there's even more I can achieve if I only put my mind to it. I would advise every mother-to-be and her partner to try HypnoBirthing even if they intend to use drugs. I've never felt so well prepared for anything in my life! I went into labour, totally fearless. HypnoBirthing was a huge, huge, huge help. It was phenomenal. Even the midwife said: "I've never seen anyone deliver like that!" I'm so pleased that I was able to have the birth I wanted, and do it my way. People have commented that they've never seen me looking so well. I have let go of a lot of anxieties and the baby is so relaxed too because my response is much calmer. I'm so pleased I found you. Thank you! I hope our story will inspire people to know that labour is such a natural process that it is possible to have a wonderful experience. It was brilliantand without the HypnoBirthing course I would never have considered a home birth. My baby is so calm and contented and I feel this was because the birth was so relaxed and easy. Also the recovery time after this birth was considerably reduced, within a few days it hardly felt like I'd just been through labour at all. It has been the catalyst for a relaxed and loving start to my baby's life, which I can't thank you enough for, as without you and your course we would never have had such a wonderful experience. Thank you for your inspiration and encouragement that has given us the best experience of our lives. To start with, the Rainbow Relaxation & affirmations helped so much in the build-up to the birth - I had high blood pressure and was advised to finish work a little earlier than planned. After 1 week of doing the Rainbow Relaxation twice a day my blood pressure was back to normal & I was able to continue working for an extra couple of weeks. This gave me a lot of confidence that the birth would be manageable at home for as long as I was able to stay there for - which turned out to be for the whole birth, much to Scott & my surprise!! I woke at 02:30 on Thursday 24th Feb to an uncomfortable feeling that could not be dismissed as anything other than the start of labour, so I settled down & did some sleep breathing to relax myself - once the surges got a little stronger at around 4am I had a 4 hour bath, listened to the music CD & went well and truly into deep relaxation. Scott played the CDs for me & said that he tried to talk to me but I was so deeply relaxed that I just looked at him with a 'tranced' look on my face & continued to focus entirely on my breathing & rocking my hips back and forth - I stayed mobile throughout the entire birth experience. When my waters broke at 11:30 I felt my breathing change quite naturally - I'd phoned the hospital & my midwife before my waters went & they both assured me I had 'hours' to go - so when the midwife phoned at 12:40 she told us to take a slow drive into hospital.......Nade was born 15 minutes later. As soon as Scott got off the phone to the midwife I had a strong urge to push & breathe very deeply, I felt the head & got Scott to phone for an ambulance at that point. Poor Scott thought he was going to deliver his son on the bathroom floor & I'm not sure who was more relieved when we heard the ambulance coming down the street. Dave the paramedic was up the stairs & was just in time to catch Nade as he made his entrance. I had about 8 people come & see me specifically to ask about the hypnobirthing & I couldn't endorse it enough - looking back I can see how well I handled the situation & my friends who've had babies can't believe how well I coped (I think they were all very sceptical even though they didn't say anything). The next one will definitely be a planned home birth though. The CDs are invaluable even after the birth, Nade sleeps well at night with the music playing in the background & I have been able to do some deep relaxation at the same time which has helped me cope no end with the major changes that have happened since his birth. Men's role as HypnoBirthing partners is clearly key to the whole success story and being actively involved in the birth of their children allows men to bond easily and immediately with them. Dad’s story ... I always had every intention of being a hands-on partner during birth as I have every intention of being a hands-on Dad. I have friends who’ve had next to nothing to do with their child’s birth and it didn’t seem right to me. I wanted to start as we meant to go on as parents – a team. Birth, particularly hypno-birthing is an endurance event to be proud of. I’ve done marathons and Ironmans and this is easily the most challenging and the most powerful of all. It’s about energy; your energy, your partner’s, and the baby’s all working together as one. But it’s important to remember that a woman’s body is doing everything naturally to prepare her for birth; adrenaline, hormones, endorphins – your body, the male isn’t doing any of that, not in the same way. I think fight, flight or freeze comes in to play. Prepare your body to ‘fight’ but in calm, supportive, heroic way – really, be the hero she wants you to be. Just remember to fuel it. I suppose our birth story follows the same/usual trajectory really in terms of what happened when. Where it differed most was that the ‘medical’ information came through me. Even if at moments Laura could hear them asking me that they’d like to examine her, I acted like a gate-keeper which made her feel safer. It can be difficult to hear that you’re at 5cm to find out 4 hours later your still only 6cm. You have to leave it outside the room! 1cm at that stage is a 20% increase – that’s what I went with, spinning it to a positive. The nurses are only doing their job and speaking in a way that they trained. A key moment came when it came to what he hoped would be the last examination – were we 10cm dilated? I knew Laura was spent. I wasn’t much better and I was really questioning how much more we had in the tank. The nurse confirmed that we were at 10cm and it was time to ‘deliver’. She then told me that Laura would have 1.5 hours before a doctor would have to intervene… what the hell does that mean? ‘Start to push but the clocks ticking?’ I couldn’t tell Laura that. I literally swaggered back in, full of smiles and said ‘We’re at 10cm, in 1.5hours our baby will be here’. Laura beamed. In a split second our tanks were full and we got back in ‘the zone’. That’s my second overriding memory and something I was key in creating; the zone, the bubble. We built a connection between us, when Laura breathed I encouraged, when she relaxed I massaged and stroked. When she had to ‘put the hammer down’ I coached. If Laura wasn’t comfortable I moved her, machines and all. It’s so easy to get bound by the room, the nurses, the bed – the MEDICAL. It’s not familiar. Make it familiar, make it home. I watched the midwives with the wires and sensors so I knew how to move Laura with them. When she needed the loo, I took her. When she wanted to move, we danced. When she was uncomfortable I moved the bed. Honestly, I took over. I cleaned her bum, I changed dressings, I made tea, I massaged. The point is, we made the experience ours, we owned it. We lead it, the nurses just helped - we had control. When it felt like we lost control, we took a moment and got it back. I believe this is why the midwives asked if I’d like to deliver Aurora. I had secretly hoped to do it but the TV programmes had made me think it was impossible. Rubbish. With guidance I stood at Laura’s side so I could move between her head and the ‘business end’. I could tell Laura everything with excitement and amazement in a way that was familiar to her, from my heart. That made Laura feel excited too, not scared. The following happens in seconds, literally seconds. The baby’s head emerges and retreats with the surges, suddenly a blue head ‘pops’ out – bam! The midwife guided my hand to support the head and explained what would happen on the next surge, needless to say I had a gorgeous little fast asleep, gooey, blue baby in my hands before she’d even finished the sentence. That’s it. Done. It’s funny, all of the questions I had before the birth were about these few precious seconds. What’s it going to smell like? What’s the baby going to feel like? I wanted to prepare my senses with all of the stuff no one thinks to ask but is the stuff that will most likely make you ‘freeze’ or faint. Trust me, in the moment you won’t even notice the blood or the fluid or swollen body parts that have made this possible; you’ll just have a very slippery blue baby that is the 2nd most precious person you’ve ever met. Your body as an animal will make you right at home, full of love and care. Listen to your body and go with it. I laughed, I cried – everything all at the same time. You’ll definitely have a newfound respect for your Mrs. Tell her; it’s exactly what she wants to hear. I was very cynical about the midwives – they wouldn’t understand. I was wrong, they’ve been around the block, they’re just at work. You’re having the most profound moment of your life and they’re just at work! The midwives were brilliant, every step. I was blown away when our midwife told us she had witnessed hundreds of births but hadn’t seen anything like ours. I’d say to anyone: that is possible for everyone. Hypno-birthing for me was about learning where to take Laura when she was at a crossroad in her mind. Guiding her away from ‘pain’, ‘tightness’ and ‘fear’; all of the things that cause complications and instead encouraging her to focus somewhere else; ‘the cove of confidence’ or ‘cloak of protection’ whatever you want to call them. Incidentally I still use the cloak of protection almost everyday at work. The methods of unlocking those doors are simple: breath, touch, soft spoken words – it’s not A-level physics. Hypnobirthing allowed me to play an active, integral part of my daughter’s birth. Laura is telling me as I write this that I was an equal partner in the birth, how amazing is that? I think I was the hero she wanted me to be. EVERYONE SHOULD KNOW ABOUT HYPNOBIRTHING! So, below is our birth story. It's a bit long so do feel free to cut any bits out, but I do really hope this helps others believe in what hypnobirthing can do. I don't mind sharing that as a first time mum, I was initially scared of giving birth, and having suffered from anxiety in the past, I was keen to do all I could to ensure a less scary experience. Plus having watched a few episodes of 'one born every minute', I was amazed when I saw a couple of hypnobirthing videos on YouTube where the women seemed to be in very little pain. So I thought it was worth looking into; I came to it quite late on in my pregnancy but the impact it had on our whole experience was fantastic, and our birth experience was really not far off the birth story I'd dreamed of and written down. The first thing that happened was that my waters broke; it was 9:30am the day after my due date, and I was actually at my 40 week appointment with my midwife, Harriet. Harriet did a quick internal examination and said my cervix was really stretchy and I was already 2cm dilated. It was obviously not ideal as my waters breaking meant we had a time pressure on us due to an increased risk of infection, but I wasn't too worried at that point. I headed home and called Ian, but we decided he should stay at work for the time being. So I got comfortable bouncing on my birth ball and watched some TV. My surges started around lunchtime, so I had the chance to practise my breathing and visualisation techniques, which seemed to work well to keep me calm and relaxed. Ian came home at around 2pm, and we spent the afternoon watching DVDs. As my surges started to become stronger and longer, we started timing them. Although they were getting longer, they weren't consistently getting closer together, but by about 9pm I'd had a few around 5 minutes apart so Ian called the maternity triage line. The midwife asked to speak to me, and I guess I must have sounded too calm as she said not to go in until my surges were 2-3 minutes apart! I was finding it more difficult to relax through each surge but Ian kept me focussed and positive. Around 11pm we decided we should try and get some sleep, but after just two surges lying in bed, I had to get up again as I found it so uncomfortable. So I headed back downstairs and sat on the sofa listening to my MP3s, and dozing between surges. At 2am, I went to use the bathroom and saw some blood in my waters, so we called the triage line again and they advised us to go into the MLU. The journey was quite uncomfortable but I kept breathing through each surge and we made it. The midwife examined me and said I was 3cm but she could stretch it to 5cm. She said we could stay in if we wanted or go home and see how things progressed. We decided to head home, knowing that if we weren't much further along by 9:30am, we'd need to go back in anyway as it would have been 24 hours since my waters had broken. Back home, Ian went back to bed and I sat on my birth ball again. My surges had started coming really intensely in my lower back, and already I was feeling urges to push. I wasn't expecting this, and I have to admit I found them very painful, but I just kept my breathing up and my mind calm and the hours rolled by. Come the morning, my surges were really no different so we were advised to go into the labour ward where I would be assessed. After spending quite a while in a waiting room, we were eventually shown to a room where I was asked to get on the bed so they could attach a continuous monitor. I didn't want to be lying down or be strapped up to a monitor but they said they needed to see how baby was doing. The midwife then started talking about being induced as although baby was fine, it had been more than 24 hours since my waters broke. I was quite upset by this point, and exhausted from nearly 24 hours of surges, so I was more than a little relieved when Ian took control and told the midwife this wasn't what we wanted. Once he had explained what we'd hoped for, the midwife spoke to the MLU who agreed to take us for four hours to see how we progressed. If I was no further along after four hours, they would induce me. So, finally where we wanted to be, we settled into a lovely peaceful room and the midwife set me up with some aromatherapy oils to breathe and for Ian to massage my lower back with. I was still just taking each surge as it came, and although I was finding them painful, they were manageable with my breathing techniques. Knowing each one would be over in only a minute or two and each one was bringing me closer to meeting my daughter just kept me going. Four hours later, at around 4pm, I was examined again, and was now 8cm dilated - I was delighted as it meant I was able to stay where I was. A short time later, the midwife ran the bath for me. It was around this time the woman in the room next door started screaming in pain...and I started doubting myself! But Ian knew that meant I was going through transition and we would soon be meeting our little girl, so he just kept up the encouragement. Not long after I got in the bath, at 7pm, the midwives' shifts changed. I was thrilled as my community midwife, Harriet, had come on shift, and took over our delivery. She was great, equally as encouraging as Ian and the three of us sat there with the lighting dimmed, music on in the background and chatted away. Harriet kept checking our daughter's heart rate after surges and every time shook her head in amazement; "she's as happy as Larry! ", which just made me feel as though I really could trust that 'my baby and body know what they're doing', as one of my favourite affirmations went. As my baby started crowning, coming down the birth canal and going back again a few times, Ian went and made us all a cup of tea. Both Harriet and Ian say their lasting memory of the birth was of me sat in the bath, a baby's head between my legs, while I drank tea and ate chocolate, chatting and laughing! Soon afterwards, our daughter's head came fully out, and I prepared for the final push. As she came into the world, Ian leaned into the bath and delivered her into my arms, and we sat in the bath for some time just staring at each other in amazement! It was incredible, I had done it! We waited for the cord to stop pulsing before Ian finally cut it. I'd also opted for a natural third stage, but unfortunately my placenta wasn't coming away so I chose to have the injection and have Harriet help deliver it rather than risk having to go into surgery to have it removed. So, Rosa was born weighing 6lb 9oz at 8:31pm. I'd not really realised, but at 36 hours from my waters breaking, apparently they would have taken me in for a C-section; Rosa was born after 35 hours! Harriet still says she was on a high for days afterwards, and tells my story regularly to show how a birth experience can be. I had no pain relief (apart from a bit of gas and air when my placenta was pulled out) and purely relied on the Wise Hippo breathing techniques I'd learned in our hypnobirthing classes. These were all I needed; for me, I struggled with the visualisations but then I had done throughout practise so that didn't come as a big surprise, and I just accepted they weren't going to be part of my birth experience. It wasn't quite as I'd envisaged; it did hurt, but I felt totally confident that I could cope with it. I also wasn't completely quiet like the women I'd seen in some of the hypnobirthing videos, but I found the primal, animal-like instincts took over and apparently I needed to let some of the energy out vocally. The other major benefit of hypnobirthing for me though, was what it taught Ian. I would probably be telling a very different story if he hadn't had the confidence gained through our course to question the midwife who wanted to induce me. And if this isn't enough to convince people to at least try it - of the five couples on our antenatal course, I was the only one who had an amazing birth. There were two C-sections, one vontouse delivery and one forceps delivery between the other four, and all remember their birth experiences as being awful. It may just have been a coincidence, but there's also a chance it wasn't, and I definitely would recommend hypnobirthing to anyone for that reason! I'm happy for you to share this in any way you wish as I'm just amazed more people don't know about hypnobirthing and the impact it can have on your birth experience. IT SHOULD BE COMPULSORY FOR EVERY MUM TO BE! We did have an amazing birth. My body tried to make it memorable again having a very looooong period of surges but the time distortion made it all go smoothly (-ish I had my moments 🙂 . We had very supportive midwives and did feel this time that it just happened the way we wanted. The birth stage was just beautiful and Andy was the lucky one to put first hands into Rebeca and bring her to me. Rebeca is the most chilled out baby on earth so far... And it melts my heart to hold her... and that's all what I'm doing so far while poor Andy is dealing with the rest. We would love to catch up with that coffee to introduce you to Victor and Rebeca. I am still on 5,4,3,2,1 relax... And can still hear the sea of serenity in my head, it does seem to have had a good effect on Rebeca. Thanks a lot for all the amazing hypnobirthing techniques that we learnt with you. It should be compulsory for every mum to be. I'd been meaning to drop you a line anyway to say thank you for your hypnobirthing course. We ended up going to an NHS antenatal course and also an NCT one but all they did was reaffirm things that you had already discussed with us - although in a way it was good to reinforce our ideas. However, none of the other course leaders were anywhere as good as you and I wanted you to know that I found your course useful as antenatal info as well as hypnobirthing teaching. My labour ended up being induced due to blood pressure spiking high combined with a predicted big baby (she was 10lb 2oz when she arrived) and the induction worked instantly so I think I'd been hovering on the edge of labour anyway. Throughout the labour I remained calm and I have huge gaps in my memory where I think I was simply "in the zone" of having contractions and relaxing in between. I think the most important thing that I learnt from your course was to take the trust I already had in Ben and to take it to a new level. He was absolutely perfect during the labour and everything I needed - he got all the information from the medical personnel when we needed to make a decision and then he'd talk calmly directly to me to confirm the decision. Had the mischievous little (or big!) baby not decided to turn her head at the last moment and try and come out ear first then I think it might have been a successful natural birth. As it was we ended up with attempted but failed forceps and then c-section under general anaesthetic as the epidural had stopped working. However, I still count it as a positive experience as no-one forced us into anything at any point. We had a demon of a midwife who completely protected us from all the other medical personal. It was a great experience and I was so pleased to remember all the deep breathing exercises to remain calm and zoned out. We called our little girl Rosa-Marie Serenity and I've attached a little picture of her. MIDWIVES ENJOYED THE BIRTH TOO! Really good to hear from you. Hope all is well?? Sorry we haven't been in touch the last couple of weeks have been a bit of a blur. Finlay Brown joined us 2 weeks a go today - weighing in at a whopping 9.2lbs (we aren't too sure where he was hiding) the midwives were quite shocked when he came out. The birth went really well, had a very relaxing day on the Monday with light surges throughout the day. Went for lunch and had a walk, and then at 10pm that evening it all just went mad. My surges went from every 10 minutes to all of a sudden 3 minutes apart, we arrived in Wallingford by 10.45 and Finlay was born by 7.30 the next morning. Considering he was back to back we managed to have a nice quick and smooth birth. I think part of it was primal instinct to make some noise - and as he was back to back my urge to push was much sooner than I needed to. I used gas and air for about an hour when I was 8 cms to help manage the pushing urge but things progressed quickly and he turned when he needed to. The water bath helped manage the pushing urges until that point. My waters never broke so he came out in his sack - which apparently is quite uncommon so he is a true water baby. Patrick was brilliant and helped me every step of the way. 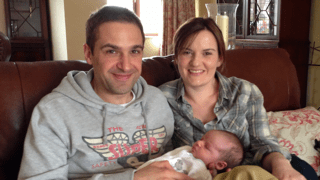 The midwives commented on how controlled we were and what an enjoyable birth it was for them. They said that is heart rate didn't fluctuate at all throughout the birth which showed how relaxed Fin was throughout. I will send on some pictures soon. Thank you so much for all your help and we are so happy with how our birth went thanks to hypnobirthing. Several of my friends have had babies recently, and many of them told me it was a traumatic and stressful experience. Thanks to the techniques that Jenny taught us, I was able to help Catherine right the way through, and we both thoroughly enjoyed the birth - it was fantastic"
I gave birth to Fintan Joseph on Mon 10th May at 20.04. My surges started irregularly about 1pm, I then started timing them about 2pm. Called Steve home from work at 3pm, because I wanted to relax more. Had a long deep bath, and they seemed to kick in fully then. Midwife arrived at 7pm (when I was 7cm) and Fintan was born at 8.04pm. Pretty swift really. Oh and I had him at home as planned - which was lovely. Midwives were well impressed at how calm and serene I looked. I found that sleep breathing was excellant. It really did make the discomfort go away and is empowering as you know what your body is doing so you work with, instead of against it. Steve was a fantastic birthing partner, calming me and talking me through my breathing - I wouldn't have been able to do it without him. I played the CD constantly as well, and kept saying the affirmations in my head to make me focus on the job-in-hand. As for the J breath, I loved it - it made the actual delivery easy-peasy. I can't rave about it enough. Plus one push and the placenta was out - who needs drugs? Believe in the power that is HypnoBirthing® and you too will be talked about at midwife meetings. Our community midwives actually said it was one of the easiest first time-mother births that they had seen in 20 years - now that is some recommendation!! Even though our baby did not turn at the end, our doula introduced us to a midwife who empowered us to switch to a doctor skilled in natural vaginal breech births since my own doctor wanted to schedule me for a C-section. Our meeting with our doula and the midwife happened the night before my membranes released. Our experience is special and one that I will never forget in my life. HypnoBirthingand our doula were very instrumental in helping and supporting me to believe it could be this way in spite of a breech presentation. The experience helped me realize and believe that you should trust yourself and your body and allow it to do what it is naturally meant to do. I can't rave enough about HypnoBirthing. My husband and I decided to do the course as I was interested in what it involved. Don't be sceptical until you have tried it. I did go into hospital as a precaution as I wasn't dilating enough [and] on entry to the hospital they wanted to give me a c-section straight away, believe it or not. However, I had a fantastic midwife who new what we wanted to do for the birth of our baby and gave us a chance to continue with that as the baby wasn't distressed. Andy took me into deep relaxation at this point and I actually fell asleep for about 1/2 an hour in the peak of my surges ... it was at this point I believe my body had rested and relaxed enough to allow my baby to move ready to be delivered. I do genuinely believe that if I had not had the hypnobirth experience I would not have realised the potential of my own body and how it needs to be able to 'get on with the job in hand' without the addition of stress which fights it all the way. My husband and I found the HypnoBirthing sessions informative in explaining how the female body works during the birth and how to maximise the effectiveness of it. The positive nature of HypnoBirthing helped me to look forward to the birth and to believe that a pain free birth is possible. We both felt very relaxed leading up to the birth. Unlike others in my NHS antenatal class, I never complained of sleep problems. The relaxation techniques didn't just benefit me; my husband, who frequently suffers from insomnia, experienced the best sleep of his life! At 9:00, the hospital sent me home and told me to go ahead with my obstetrician's appointment the next day. I should have been more assertive in insisting that I believed I would have my baby that day. My lack of pain appeared to lead the midwives to think that labour had not started. While I relaxed in the bath, at home, my husband timed my surges - 60 seconds long and 2 minutes apart - so back to the hospital we went. On returning there, at 12:30, I was 5cm dilated. I would certainly use the techniques again, should we have more children, and would recommend it to anyone. This birth was much easier than the last four - I was quite detached from any pain and I felt much more alert by the time she was born. The slow breathing and the balloon were the things that helped me most. Luis was great - he kept talking and stroking my back throughout. I feel that I have recovered much more quickly this time - I was not wiped out by the birth like I was with the others, and our baby is feeding well and is very alert. Using the breathing and relaxation techniques we were taught, I was able to get through twelve hours of contractions with absolutely no pain at all. All I could feel was pressure. The final part, where I was pushing Mia out, stung a little bit but that was all, and I didn't need any pain relief - not even gas and air. What's more, my sister saw me soon afterwards and said I looked as if I'd just come back from a health farm, not just given birth!" Soon I felt the urge to push, our little "Lucy Maree" was handed to us after 3 pushes of non interference labour. I remember at one session with Peter watching a video of this total in control mother giving birth and I thought, wow. But no I still don't think I'll be like that. .... Well from the first wave to the last I was like that lady, but I wasn't even trying to be. It's exactly like I learned, "Turn your labour over to your body". I was so proud of myself, and my husband couldn't believe what I was like. Due to work commitments my husband was unable to come to all the classes, he was happy for me to do the programme. The point I would like to make to all the mothers is, "It is possible to do this on your own". Geoff my husband was extremely supportive throughout the pregnancy and the birth and was so proud of me. He is now so positive of the HypnoBirthing Programme. Hubby started making tea at 4.00 but I really didn't want anything. He insisted I had something & I was just sitting down to eat it at 5pm when I felt quite 'wet' down below. There was no gush of waters, and both my other labours had started with contractions not the waters going, so I was quite dubious at this point that it was my waters. I ended up changing my knickers & trousers 3 times in the space of 10 mins before thinking that maybe this was it. I told my hubby "I think my waters have gone" and sat back down to eat some food, figuring that it'd probably be hours before anything would happen, but just hoping that something did start, because I really didn't want to have to go in to be induced. At that point my waters went with a gush. I wasn't going to phone the midwife at this point but hubby wanted me to, and I decided it'd be a good idea to get in first, as another one of her mums-to-be was booked for a home-birth at the same time, so just in case she also went into labour I thought I'd let her know. I ran a bath & started playing one of my HypnoBirthing CDs that my trainer had given me for when I was in labour, and phoned my mum to let her know (she lives in Kent, I'm in Wales, and she wanted to try & make it down in time for the birth). While I was in the bath I started getting contractions, and I knew this was it. I got out of the bath at 5.55 & the midwife was knocking on the door - she'd been passing the house & decided to call in to listen in on the baby. I told her the contractions had started, so she said she'd examine me as well. At 6.15 I was told that I was 4cms & my cervix was very thin, [and] the midwife said I'd deliver between 3-6 hrs, which I was very pleased with. She said she'd go home & I was to phone her when I felt I needed her here. Hubby was still putting the kids to bed so she said she'd put my TENS machine on for me before she went. By the time that was on (6.25) I felt very tired I said I wanted to lie down on the sofa. I started my relaxation & breathing & the midwife actually asked if the contractions had stopped, as I was making no noise & was so relaxed. No, I said, they're getting a lot stronger. They were also coming every 2 minutes. Luckily, at this point she decided that she'd stay as she thought I was progressing quickly. I say luckily because at this point, it was 6.35 & I could feel the baby coming down. It was the oddest feeling, because my body was telling me this baby was coming, but my head is telling me "you're being silly, you were only 4cms a couple of minutes ago". Thank goodness the midwife realised what was happening & managed to get my trousers & knickers off while phoning the other midwife to tell her to come. I admit I did lose some of my composure at this point. I couldn't believe what was happening & that it was all so quick. The second midwife arrived within minutes, and was here just in time to help me get onto my knees to deliver. Tamina Rose was born at 6.50pm to a very shocked mum & dad. We hadn't managed to get my music on, or anything set out in the room, so the carpet got a bit wet. I was in shock for a few hours & needless to say my mum didn't get here in time, although she arrived at around 10.30/11pm that night. The girls had fallen asleep by the time we'd cleaned up the mess & we went to get them, so we waited until the next morning to show them their baby sister. I have nothing but good things to say for the HypnoBirthing� course that I did. I am convinced it contributed to my quick labour & until the point where I had a little panic when I realised how quickly she was coming, I was very comfortable the whole time. I only wish I'd had a longer labour in a way so that I could have put more of the techniques I'd learned into practice. Tamina is an angel so far. I think the quick & calm birth really shows in her, as she's slept & fed well right from the word go, and only cries when she wakes for a feed - which is totally different to the way her sisters were, who both cried for hours on end, especially in the nights. I was also delighted to get back into my jeans exactly a week after the birth & I'm now 9lbs lighter than when I got my BFP so I'm very pleased with that. And Tamina is absolutely arored by her sisters, so I think she's going to be a very spoiled little girl with all these women fussing over her.